"This is the Great Scottish novel, got it all and just a wee shade more ... Classic." Can't beat that, can you? Nigel Bird's latest publication 'In Loco Parentis' is also getting a lot of love. The book has been described as 'Teacher Noir' and is available as an eBook and in paperback. Graham Smith's third short story collection in less than six months, Gutshots, is out now. More than somewhat prolific that man! Into The Shadows is the début short story collection from Steven Miscandlon. Miscandlon is also well known as a talented designer of book covers and this dark collection certainly looks like the real deal. 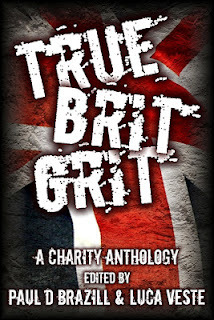 And, if you want to get a taste of ALL of the above Tartan Noir writers and more of the Brit Grit Mob, you could do worse than picking up a copy of True Brit Grit - A Charity Anthology, which I edited with Luca Veste, and also features a cracking cover from the aforementioned Steven Miscandlon.